Phosphorus is a nutrient important for plant growth. In most lakes, phosphorus is the limiting nutrient, which means that everything that plants and algae need to grow is available in excess (sunlight, warmth, water, nitrogen, etc.) except phosphorus. This means that phosphorus has a direct effect on plant and algal growth in lakes – the more phosphorus is available, the more plants and algae there are in the lake. Phosphorus originates from a variety of sources, many of which are related to human activities. Major sources include human and animal wastes, soil erosion, detergents, septic systems and runoff from farmland or fertilized lawns. Phosphorus is usually measured in two ways in lakes, ortho-phosphate (soluble reactive phosphorus) and total phosphorus. Ortho-phosphate is the chemically active dissolved form of phosphorus that is taken up directly by plants. Ortho-phosphate levels fluctuate daily, and in lakes there usually isn’t a lot of ortho-phosphate because it is incorporated into plants quickly. Total phosphorus (TP) is a better way to measure phosphorus in lakes because it includes both ortho-phosphate and the phosphorus in plant and animal fragments suspended in lake water. TP levels are more stable and an annual mean can tell you a lot about the lake’s water quality and trophic state as shown below. 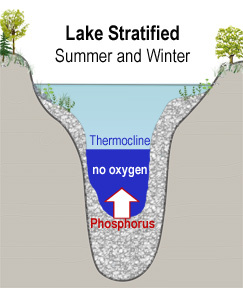 Another way that phosphorus can enter lakes is from the sediment at the bottom of the lake. 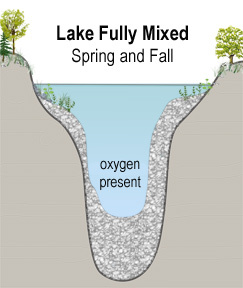 When the bottom of a lake is anoxic (usually in late summer and late winter), chemical processes at the sediment/water interface cause phosphorus to be released from the sediments. This phenomenon is called internal loading because the phosphorus is coming from within the lake (from the sediment) When the lake mixes again, this increased phosphorus fuels algae growth (more information on lake mixing). If phosphorus inputs are decreased or eliminated, less plants and algae are able to grow and water quality can improve (more information on improving water quality).